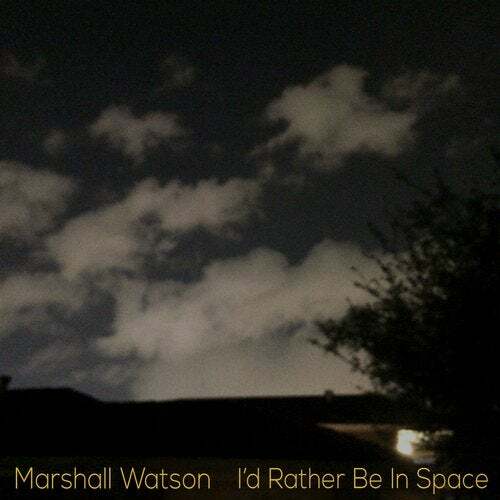 ABOUT "I'D RATHER BE IN SPACE"
"I'd Rather Be In Space" is a stunning collection of instrumental music from accomplished composer Marshall Watson. Falling into the broad categories of electronic and ambient, the album transcends both. The sound palate is rooted in the classic instruments of analogue sound synthesis - Korg, Juno, Moog, Prophet. Piano, guitar and field recordings were also utilized. The result is a transformative album with a timeless feel. Enjoy this future classic. In the artist's words: I'd Rather Be In Space is a collection of improvisational and generative music, performed and recorded in San Francisco in 2016. It is my soundtrack for ordinary days as viewed through the windows of buses, and experienced on the city's sidewalks and alleys. For this work, I relied less on the computer, and attempted to capture the music of the moment without a lengthy editorial process (if any.) I found myself getting lost in the sound as the machines interacted with each other, and often times, I just hit record and let the sequences run, playing along and hoping for the best. The result of this verite style approach, is an ambient, cyclical, synthesizer- heavy soundscape inspired by works of Eno, Reich, Smith, and the city of San Francisco itself. Marshall Watson (Shane) is an accomplished electronic music producer and remixer. During the 90s, while living in New Orleans, he discovered electronic music through acts like Orbital, Rabbit in the Moon and DJs Sasha, John Pigweed and Chris Fortier. During this time in New Orleans he befriended progressive house icon, Pete Lazenby and through a series of existential music conversations between the two, (and a short stint promoting a DJ night with Pete by the Mississippi River) Marshall began his production career. In 2016 he released the Sitting Near Dreaming EP an ambient work on the Barcelona Label, Seven Villas Voyage, sister label to Seven Villas. HIs third album, I'd Rather Be In Space, is due out on Looq Records in early 2017. Marshall lives in San Francisco with his wife and two cats. He is the Music Director at Sirius Sound and a composer for Swell Music and Sound.